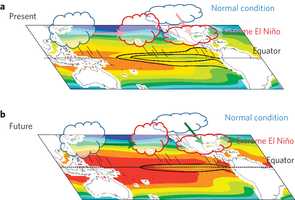 In both present-day climate (a) and future climate (b), convection zones in the western Pacific and the ITCZ latitudes shift from their normal positions (blue clouds) to the equatorial Pacific during an extreme El Niño event (red clouds). For the first time, in a research article published January 19 in Nature Climate Change, PMEL’s Dr. Michael McPhaden and a team of international scientists provide robust and convincing evidence that greenhouse warming will double the chance of extreme El Niño events in the coming decades. The scientists examined 20 climate models and found a doubling of extreme El Niño events, like the one in 1997-98, from present-day through the next 100 years in response to greenhouse warming. For more information on El Niño, please visit the Tropical Atmosphere Ocean project website.